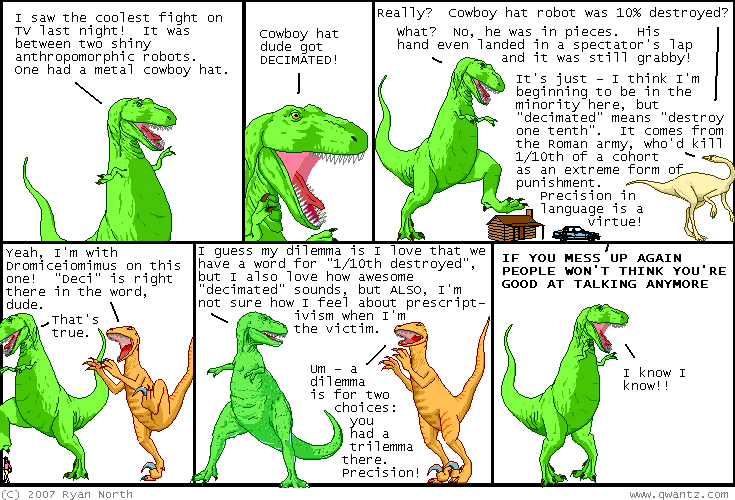 Random reminder that Dinosaur Comics Is Awesome. Awesome in the awe-inspiring sense. When I started reading I was impressed by the fertility of the seemingly bare premises. There was already a ton (read months) of material to go through. I kept current for a long time. I stopped visiting it daily maybe two years ago. Just a quick dip once a moon. And always: this comic amazes me. Just plain fun. Witty, bright, clever, insane, profound, intelligent and so funny. Ryan North has been doing this for more than 6 years. If the layout of the archives page is to be any hint we will still have them until the end of December 2009. Also: there are 1436 comics on this page. One thousand four hundred thirty six. I. Am. Amazed. I declare Ryan North to be the most pertinaciously funny daily comic writer ever. Rice Boy Comic is a very colorful imaginative piece. I just love the way it’s paced and the somewhat naïve tinge. A marvel. We the robots is brand new, grandly bland and my official new comics crush.